Note: Update from Google added (bottom). We have performed a survey of the top 10,000 websites on the Internet to find out not just how many of them are using Google Analytics, but also the division between the legacy urchin.js script and the new ga.js script. First of all, a full 50% of the top 10,000 sites on the Internet use Google Analytics. That’s a very impressive market penetration even from a known market leader. Secondly, out of the sites that use Google Analytics, 40% are still using the old version of the Google Analytics script, urchin.js. That second point is very important. Google switched its development over to ga.js well over a year ago. It’s truly remarkable that almost half of the sites using Google Analytics have yet to migrate to the new ga.js script. When Google migrated to ga.js, it stopped maintaining urchin.js. This happened way back in December of 2007 when the new tracking code went live to all Google Analytics users. The question is, for how long will urchin.js keep working? Back when Google made the switch it was widely believed that Google would stop supporting the old script after 12-18 months. If that is the case, the end for urchin.js is getting near. “The information we are getting from Google is that urchin.js will be decommissioned sometime this summer,” says Julien Coquet from LBi, a Google Analytics Authorized Consultant. When we asked Julien what will happen once urchin.js is decommissioned, his guess was that it will eventually start returning a 404 error (file not found) and therefore stop registering traffic. Blogger.com, Doubleclick.com, IGN.com, Foxnews.com, Match.com, Wired.com, iStockphoto.com, PCWorld.com. More convenient set up for tracking ecommerce transactions. More customizable code for interactive Ajax-based sites. Access to new features and reports as they roll out. We switched Pingdom.com over to using ga.js quite late (at the beginning of this year), and we were curious to see how many sites were still using the old script even this late. Though we had expected many to still be using the old script, we were definitely surprised to see that it was as much as 40% of the Google Analytics sites. The question is, are the owners of these sites aware that urchin.js won’t be around forever? Are they aware that they are using a legacy script that is no longer being maintained? When urchin.js is finally decommissioned, will thousands of sites be caught without working statistics? We’re guessing that Google won’t allow this to happen, but you never know. We have no immediate plans to decommission urchin.js. But there will come a time when we do and at that point, we will make sure users get clear advanced notification from us and time to switch. In the meantime, there are plenty of good reasons to switch to ga.js now anyhow, so feel free to get started early. In other words, no need to panic, but you should start thinking about migrating if you haven’t already, because urchin.js will indeed not be around forever. We tested the homepages of the 10,000 most popular websites in the world according to Alexa. We tested for the presence of “/urchin.js” and “/ga.js” in the HTML code, which gave us the result that 4872 use Google Analytics (1992 with urchin.js and 2982 with ga.js (a couple of sites used both, which isn’t recommended)). 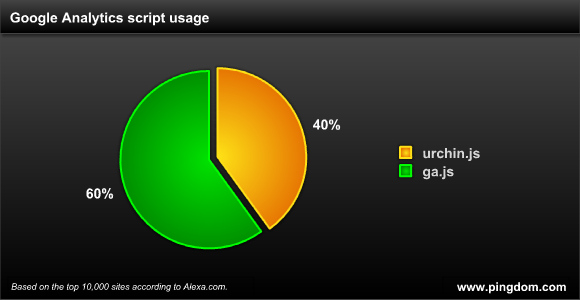 Since 242 of the sites on Alexa’s list did not yield a response, we excluded them from the percentage calculation. The reason for this is that some URLs and IP addresses have sneaked into Alexa’s toplist that aren’t actual websites, for example ad servers and CDN servers. A few sites could also have been offline when we did our test. By the way, are you all Swedes working at Pingdom or is there a mix of nationalities? I’m not really surprised to see Blogger using old scripts, even if they are from the company who owns them. Blogger is out-dated in pretty much every way. Funny thing: Google’s guide for migrating away from urchin.js doesn’t seem to be available anymore. It would be interesting to know why the sites haven’t migrated. Is this a simple communication problem where people don’t know of the new script. Or, is there a compelling reason to keep the old. @Anne: Good question. We’d love to know as well. @Philip: Sorry, missed your comment before. Thank you for the kind words. Most of the Pingdom team is Swedish (we’re headquartered here), but we have some people from Serbia too. I run two (small) websites that use Google Analytics, and this is the first time I even heard about the existence of a new script. This is despite the fact that I regularly log in to Analytics, and that they do have my e-mail address. Analytics could easily detect whether your site is still using the old script, and display a big fat warning that you should upgrade. And at the very least they should have sent out an e-mail to all their users, telling them to upgrade. Despite Google’s recent efforts, their communication around their (non-paying) applications is somewhat sub-par. Their actual communication around GA goes through their Adwords channel. GA is a 4 year old service and many people got used to the “old” urchin.js code. That alone is also a reflection of both the level of maturity and complexity of web analytics. Google democratized web analytics by making it available to just about anyone from bloggers to corporate extranets to mom-and-pop websites. Why worry about a couple lines of code if the reports work, right? I can let you imagine how these agencies are going to feel responsible about maintaining your tracking code. Heck, agencies are just now discovering blog posts like this one and are scrambling to migrate huge sites by next summer just to be safe. But who are they kidding? The “new” ga.js code has been around since 2007 and people had tons of time to upgrade since then. Long story short: surround yourself with experts and make it your own responsibility to keep up to date with the latest GA news. I wonder why the Google Analytics site maybe doesn’t alert the person checking the statistics website to the use of old urchin.js tracking code? Heck, don’t they index the content? Shouldn’t they just “Know” things about us? Why aren’t they scripting these things for our benefit? That’s because most of these codes are added by web developers for their clients, and if the client doesn’t want to pay someone to update the code for them on their site, then it won’t happen. Was using the new version of GA, but to be honest I prefer using Firestats. It’s local, does what I want and doesn’t have any of the underlying privacy issues prevalent with Google. Thanks for your report. I took your example and looked hrough the top100 german blogs and found a similar result. Out of 100 of these top100 blogs, 64 use Google Analytics and 35% of them still use the old urchin.js. Ive been using the urchin.js script right from he beginning and check the analytics with great regularity. This change from Google is the first I’ve heard and, looking at the analytics page, I see nothing that indicates a new script has been issued. Perhaps that also explains why certain Google companies have also not changed? Someone please correct me if I’m wrong but wouldn’t this be a two second fix on Google’s end with a 301 redirect? Unfortunately, Google changed the way the code works and the changed the functions that needs to be put into the pages as well as made it easier to read and use, this means that because they’ve changed the way it works it requires people to put a new piece of script into their pages and can’t simply redirect people to the new one. I think your right, 301 redirect must solve it. But it’s not so much work to just change the code. I just used Google Analytics for WordPress plugin and update whenever there is an update to be had. Very interesting, seems I need to change to the new code. Didn’t even noticed it.